I am finally sharing photos of my holiday home! 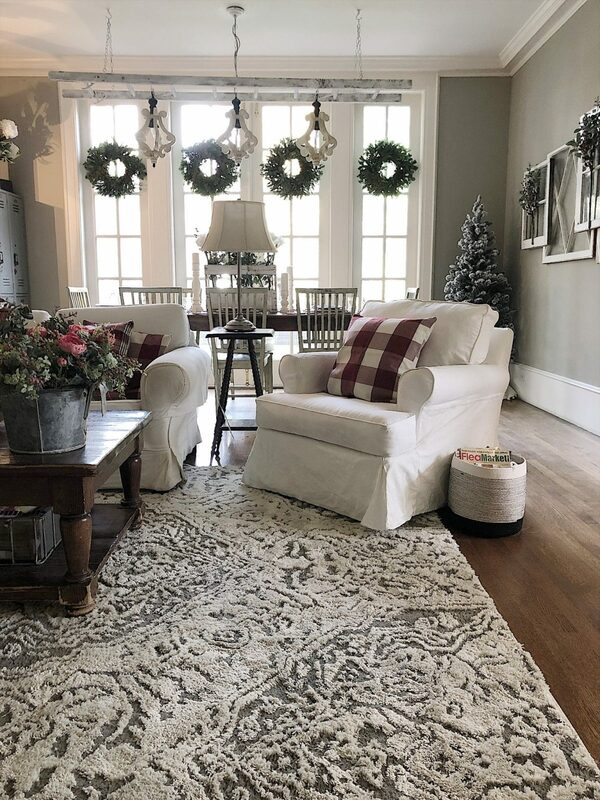 this is the first room I have decorated for Christmas and how happy that I have a new rug to share with all of you. The luxurious Francesca area rug from Mohawk Home showcases exquisite design details through its texture and stunning sheen finish. I ordered the Mohawk Home Loft Francesca Cream Area Rug in Light Grey. The neutral cream hue is perfect for almost any setting. The Francesca offers the utmost in quality and durability with Mohawk Home’s woven construction. Mohawk Home’s premium yarns are interwoven to form the vivid colorations and distinctive design details you see today. Area rugs should be spot cleaned with a solution of mild detergent and water or cleaned professionally. 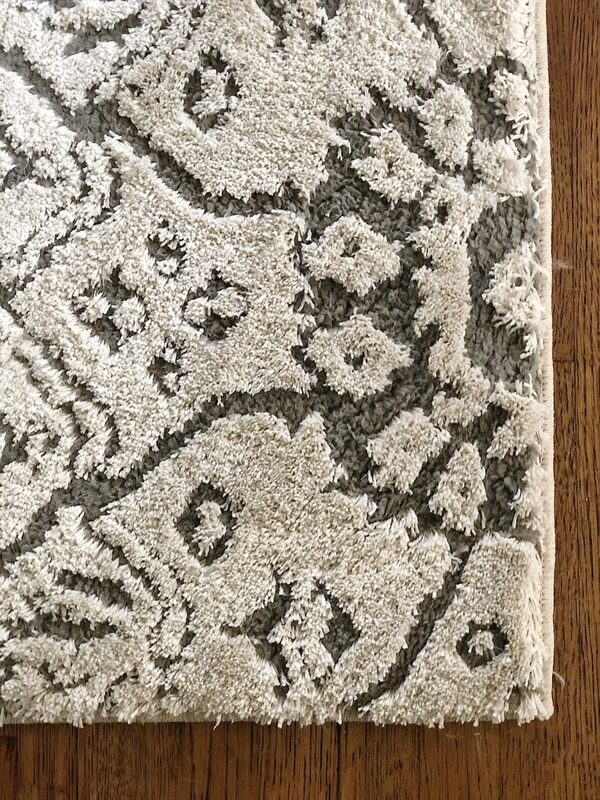 Regular vacuuming helps rugs remain attractive and serviceable. My theme this year in most of our home is red and white. I kept the decor pretty simple and am pleased to say I “recycled” almost everything. (By recycled I mean that I used the decor from all of my holiday boxes!) I always buy fresh wreaths from Trader Joe’s as they are cheaper than the flower mart. I have tiny nails in our windows that I leave up all year round (you can’t see them), so hanging them is really easy. I use floral wire to create a loop on the back and just hang them on the nails. 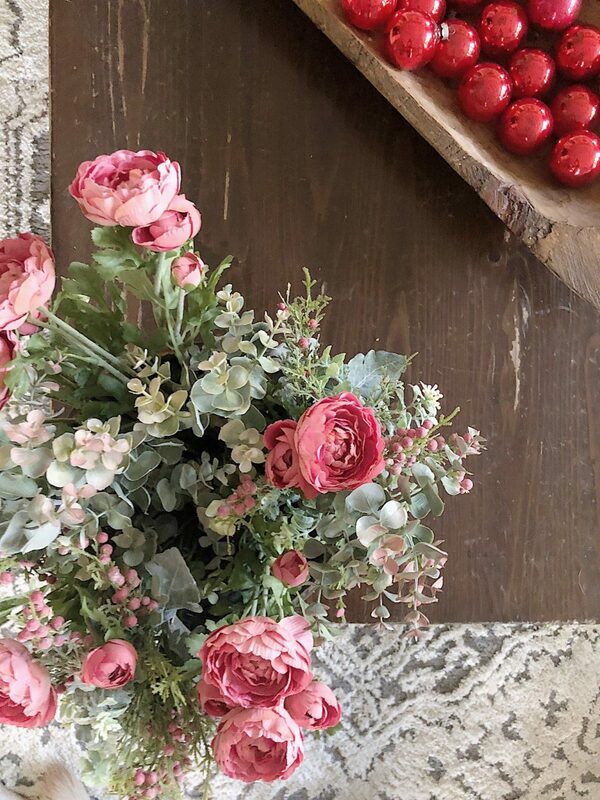 Next, I put together a faux arrangement using ranunculus, a berry floral and eucalyptus. I changed out all of the pillow covers with red and white plaid covers. Next, I filled up a vintage bread bowl with some vintage red Christmas ornaments. And I added a flocked tree in the far right corner. Of course, my favorite part of the entire room is our new rug. It’s soft, plush and so nice looking! I absolutely love it. 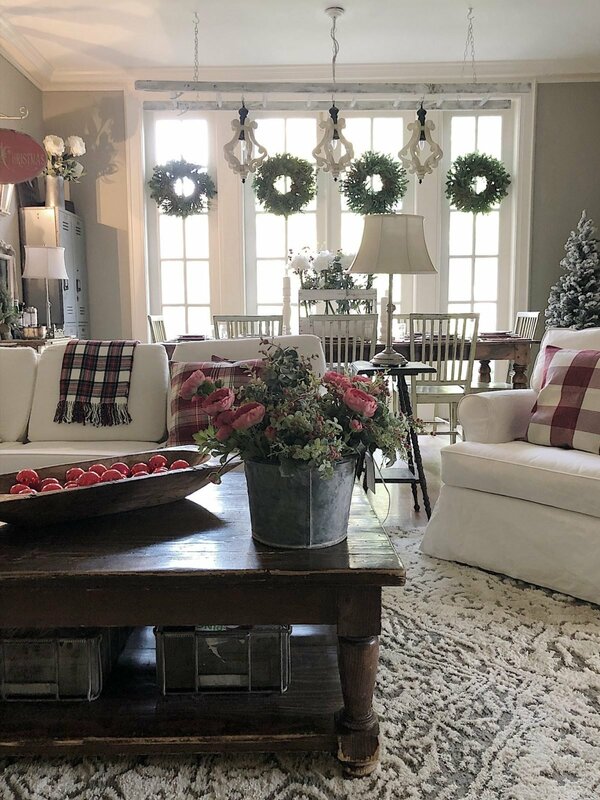 Now it is time to follow the links to all of my fellow bloggers to see their holiday decor and new rugs from Mohawk Home. 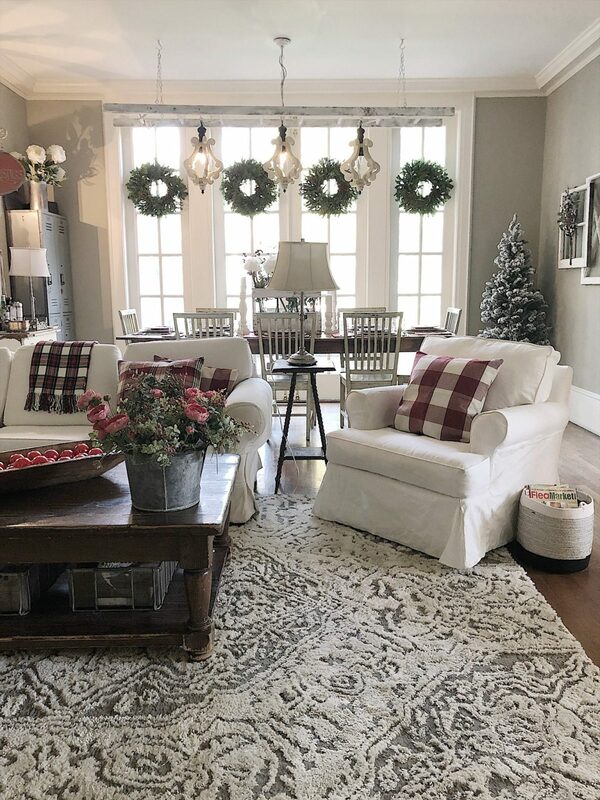 that rug is the perfect neutral grounding piece for your room and love how all of the touches of shades of red stand out against it! Love the pops of color you have added! Oh wow Leslie!! This is all so beautiful!! I love the rug you chose and your decor is gorgeous. You picked a great rug. 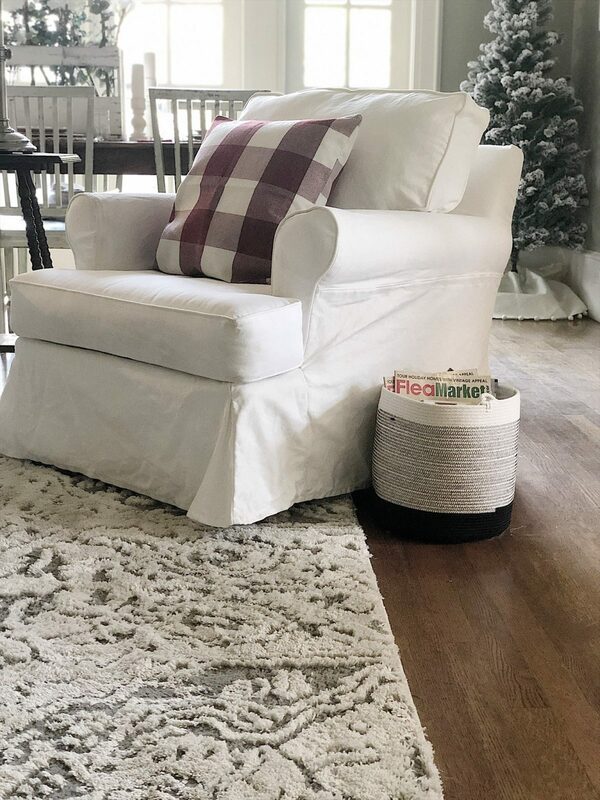 It really adds the cozy to your already gorgeous space! What size is your Mohawk rug? Hi Amanda! There are several color ways that are available on Overstock. Leslie’s is the Cream/Gray version. If that’s the one you want, Overstock is great about exchanging items! Let us know if we can assist. Very pretty! Where can I get the rug? Love it! Also, I’d like to know the paint color? Beautiful! What is the paint color? Love it! I would love to know the paint color!